And…. breathe! It’s been a busy season and the blog has been a bit neglected, although if you’ve been following us on Instagram or Twitter. you might have noticed that we’ve packed a lot in to summer 2018. As well as our mountain leading and wildlife guiding days here on Arran we’ve also been working for other fantastic companies across Scotland and overseas. Wally has been guiding Scottish bike tours for Wilderness Scotland, and I’ve been supervising young people on big adventures in Europe with our friends over at Adventure Expeditions. A couple of weeks ago things got a bit quieter, and we managed to shoehorn a cycling holiday in to our diary. Not just any cycling holiday either- this was the culmination of a long held dream of mine to tour by bike around the mediterranean island of Crete. Last time I was there I was an enthusiastic archaeology student, travelling with my mum in a clapped out Fiat Panda. I remember epic mountain roads and lots of dirt tracks. Fast forward nearly 25 years and Wally and I were hoping that not much has changed. Although we’ve both done a bit of bike touring, this would be our most adventurous and physically challenging trip to date, and our first real tour (rather than a wee overnight) using “bike packing” gear rather than traditional panniers and racks. The advantage of the bike packing set up is that it concentrates the centre of gravity close to the bike where the rider sits. The bike is more stable, and in theory more aerodynamic. Because of those hills, we packed super light, and cheated slightly by treating ourselves to the luxury of rooms and dinner in tavernas every night. This decision was spot-on, as the hills were as big and steep as I remembered, and I don’t think I'd have enjoyed them as much with a tent, sleeping bag and stove on board. Recalling those hills, I was unsure how far we’d be able to travel so only booked our first night of accommodation, and kept the rest of our options open. This was also a great idea, as we quickly discovered that riding gravel tracks with around 1-2,000m of ascent per day, and zero training, our mileage was not going to be very impressive. We were also blessed with a heatwave when we were on the coast, which made riding up hills, hot and thirsty work. We tended to keep the days short, riding in the mornings and avoiding the worst of the afternoon heat. But those hours we did ride? My god they were brilliant. We were treated to epic views of limestone peaks, studded with olives and kermes oaks. Swarms of griffon vultures soared above us while we negotiated wild gravel roads. Occasionally, we would encounter inexplicably gorgeous, perfect tarmac. On these occasions we’d say a little prayer of gratitude to the tarmac gods, for smiling on us from time to time. Contemplating the descent from the Dikti mountain all the way to the sea. 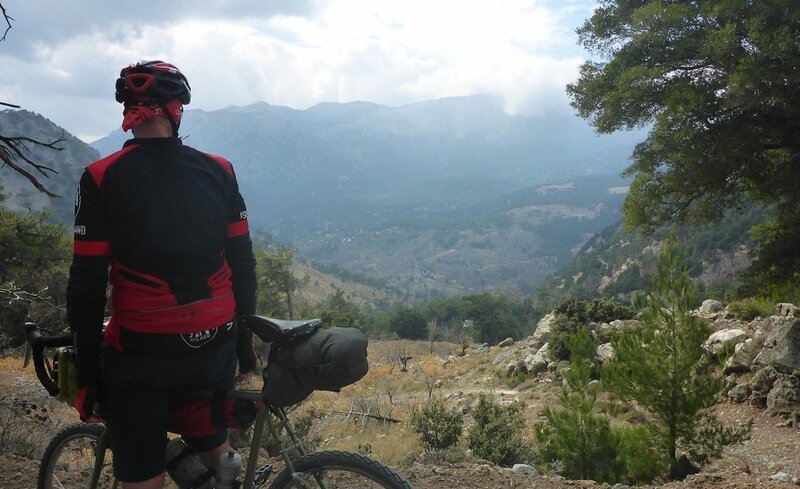 Our route took us over two big mountain traverses- the Dikti and Psiloritis ranges, but nothing was ever flat. Our traverse to the coast from the Lasithi plateau in the east, over the Dikti range and down to the sea was almost entirely off road. This was probably the finest day’s riding I think I have ever done. The views were astonishing, and the 1000m descent on farm tracks was surprisingly technical. Once we hit the south coast, we explored the Messara Plain and adjacent Asterousia Range. These smaller but equally impressive mountains (the highest, Kofinas Peak, is a mere 1280m), plunge precipitously down to the Libyan sea. The hills here are dry and dusty near desert. Our second big mountain traverse took us over the shoulder of Mt Psiloritis, via the incredible Nida Plateau (1,500m). This was the most intimidating ride of the trip for me. Locals shook their head in disbelief when we said we were taking that road, but the reality was a glorious climb on smooth tarmac with precisely graded hairpins, followed by rolling rough tracks through remote valleys, before meeting more tarmac for our descent. At the end of two incredible weeks. Heraklion beckoned, and home.